Over the years, I’ve come to find rural, small-town politics to be among my most favorite. Small towns often pride themselves on being direct in their dealings and plain in their speech; the towns in Louisiana are certainly no exception. As a result, small-town political exchanges tend to be pretty lively. With this in mind, I read this article in the Advocate the other day concerning Pointe Coupee Parish. 1) You must have a nickname in order to hold public office in the Parish, preferrably something juvenile such as “Dewey” or “Sassy”. 2) If you are an outsider, do not attempt to render aid or provide assistance. Your attempts will be futile and ill-received. “Our schools are rated higher than Iberville’s, Livingston is the crystal meth capital of the world … we have some issues with infrastructure and traffic (associated) with the new bridge. Is a parish president going to cancel that?” Cline asked rhetorically. Sure, that’s a reasonable assumption. These outside Parish officials have absolutley nothing better to do with their time than to come to another Parish in order to lord it over them. 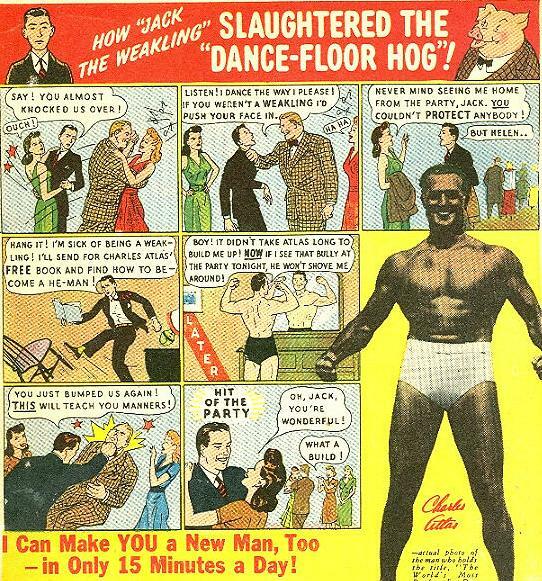 Apparently, Cline’s worldview was formed from old Charles Atlas advertisements from the middle of the last century. Pointe Coupee Parish officials have sent off for their free Charles Atlas book. Maybe it’s just me, but it seems like Cline may have developed a bit of an inferiority complex. If Cline really thinks outside officials are there to simply kick sand in the face of Pointe Coupee rather than to offer advice, he probably shouldn’t be in government. Learning from those who have gone before you is a mark of wisdom; turning your back on the advice of others because you have an irrational fear that they’re trying to embarrass you is idiocy. Plus, it looks like Pointe Coupee could use a little help. One of the benefits for abandoning the Police Jury, cited by a Pointe Coupee official, was that it would eliminate the ability of police jurors to demand parish workers cease working on a project in one district in order to work on a project in the juror’s own district. Are you kidding me? Apparently, Pointe Coupee has devolved into a series of fiefdoms. Granted, a Parish Council can still cause trouble. Come to think of it, Livingston Parish actually has experience in this area considering their recent run-ins with the State Auditor and their peicemeal approach to road repair and improvement (which sadly predates this blog, I really enjoyed following that one). There’s no way I can close this post without commenting on the “fantastic” display of diplomacy on Cline’s part. Don’t get me wrong, I’ve made several jabs at Livingston Parish’s expense concerning their crystal meth problem, but I don’t think I would ever use that as part of a public political statement. Here’s hoping Pointe Coupee gets better leadership as growth comes to their area. P.S. While it is true that the Pointe Coupee Parish School District performed better than Iberville Parish, there are a good 51 school districts with higher scores than Pointe Coupee… including both West Baton Rouge and Livingston Parishes.